Made by heat-fusing a customer’s decorative fabric to one of our special lining materials. Almost any fabric can be used: solid, print, silk, synthetic ... use your imagination! Choose blackout or translucent lining. The standard lining color is white; colored linings are available for an extra charge. See Colored Lining below. Scalloped, trimmed, and specialty hems are available - as well as fascias, cassette systems, and specialty top-treatments. See Roller Shade Options. The width of customer’s fabric shades is limited to the width of the customer’s fabric - up to 60” wide. To determine how much fabric to send, please use the Fabric Yardage Guide for the product you are ordering. Fabric should always be shipped on a roll to avoid wrinkling. Fabric that is received folded or wrinkled will be subject to a pressing charge. Please be sure that our workroom can match your fabric to your order by carefully describing your fabric on the order form and clearly identifying your fabric package when it is shipped. Ship to: Romanzia, 658 25th Street. Chetek, WI 54728. P.O. Box 72 on the address label. Romanzia inspects customer’s fabric upon arrival as a courtesy. We do our best to inform our customers of any printing flaws or fabric defects. Romanzia, however, does not assume responsibility for printing flaws, dye lot match, or other defects in customer’s fabric. Romanzia will return extra fabric only if it is requested. Only full width pieces will be returned. Selvage scraps will not be returned. Embroidered patterns often have long patches of skipped-stitch threads on the back of the fabric. When we fuse our lining to the back of this type of fabric, the lining sticks to the skipped-stitch threads in some places and to the back of the surface fabric in others - resulting in what appears to be bubbling or puckering in the face of the shade. Quilted and other multi-layer fabrics may produce the same bubbling or puckering effects. If you have a question about the suitability of your fabric, please send us a sample and we’ll fuse it to our lining material as a test for your approval. Roc-lon DenimTone blackout linings are available from Romanzia and can be substituted for Romanzia’s standard fused white lining on shades up to 54” wide. Add 10% to price of shade. See Romanzia Linings sample card. Please note that any fabric or trim supplied by the customer must already be flame retardant for the finished shades to be flame retardant. 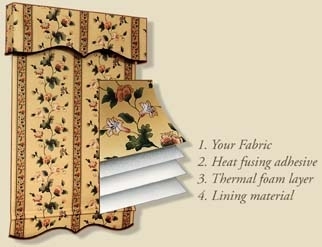 Romanzia does not provide flameproofing service for fabrics, trim, or finished shades. Romanzia makes no claims as to the fire retardancy of its products other than passing through the flame retardancy certifications of the linings that are used. Bed sheets can be successfully used to make Romanzia Roller Shades. Please supply only flat sheets. Folded sheets will be subject to a pressing charge. When using translucent lining to make customer’s fabric shades, decorative fabric patterns may be visible from the outside at night if lights are on inside.